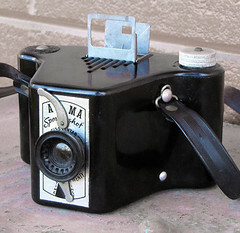 ACMA seems to have produced only a single model, the Sportshot Senior Twenty. 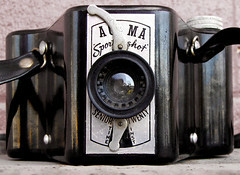 The camera was advertised as being fitted with an imported lens. It appeared on the market in late 1948 and was initially sold at 36/6. The ACMA Sportshot Senior Twenty with its Art Deco inspired design is made from Bakelite. 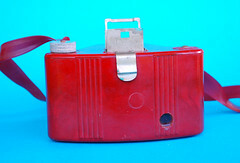 It has a trapezoidal shape and is comprised of two parts, the camera bottom, which contains film chamber and shutter assembly, and a flat snap-on lid which carries the metal simple frame finder and the film advance knob on the left. It lacks a tripod socket. 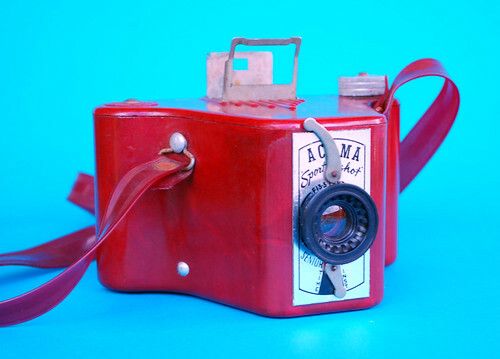 The camera shoots 6x9 images on 120/620 film (control via a red window). The camera is fitted with a Lentar 13.3cm f/3.5 simple meniscus lens . It was sold in a range of colours. Documented are black as well as the marbled shades of bright red,, brown, olive green, dark green, and probably also in burgundy. 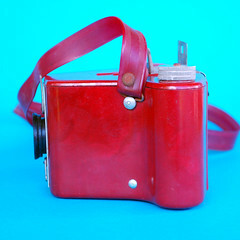 The camera was sold with a soft plastic strap in matching colours. Sub-Variant 1: the recessed part of the lens surround is comprised of concentric circles. Sub-Variant 2: the recessed part of the lens surround has a ribbed appearance. 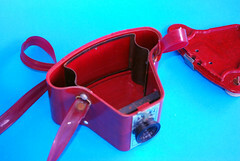 The film is loaded by partially winding the leader paper on the take up and then sliding both feed and take-up spools into position. 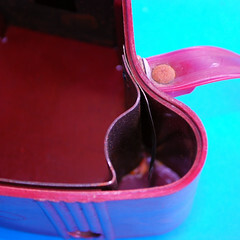 with the film fed along the curved track on the back. ↑ A search of the Australian Securities and Investments Commission Register brought no results.--ACMA is listed as defendants in a civil suit brought before the Supreme Court of New South Wales on 14 June 1950 ("Page known as Hemert vs ACMA." Law Notices for Today. Sydney Morning Herald 14 June 1950, p. 9 col. 3).--The case is not reported in the Australasian Legal Information Institute Database. ↑ Western Mail (Perth, WA) 4 November 1948, p. 46 col. 1-2.--Shown with black shutter face plate: Advertisement Morning Bulletin (Rockhampton, Qld.) 17 August 1949, p.1 cols. 7-8 (price 36/6).--Advertisement Morning Bulletin (Rockhampton, Qld.) 19 December 1949, p.8 cols. 1-2 (price 27/6). 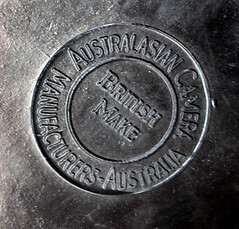 ↑ The top carries the molded model name "ACMA S20", while to bottom carries as moulded "BRITISH MAKE" sourrounded by "AUSTRALASIAN CAMERA MANUFACTURERS AUSTRALIA" set as a circle. 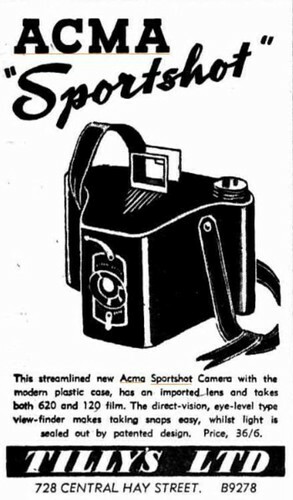 ↑ The shop box claims that the ACMA Sportshot was "the only fixed-focus camera that takes either 8 exposures of 3 1/2 x 2 1/4--OR 12 exposures of 2 1/4 x 2 1/4 using the same film." Given that the camera has no barn-door type restrictors or slide in masks, and also only has one red window (for 6x9), this claim is confusing. 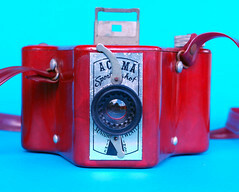 No dual format 6x6 / 6x9 ACMA camera is known. ↑ Until one actually tries to shoot with one, it is difficult to appreciate the awkwardness of the design. 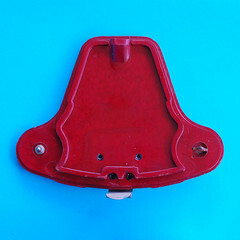 The pressure spring that keeps the tension of the feedspool is a nothing but a curved piece of metal that is prone the tear the paper leader as the feed spool is placed into the chamber. It is also surprisingly difficult to accurately line up the wind knob with the take-up film spool (which has too much play in its chamber) and to snap the camera shut. This page was last edited on 18 December 2018, at 06:27.